Herbert Kickl, Austria’s Interior Minister, has been in office for only 13 months, but he is already a record holder. In the past seven decades, nobody in a position this high has managed to cause as many scandals. Just yesterday, he scored yet another one. Kickl is part of the populist and radical far-right party FPÖ, which is the junior partner in Chancellor Sebastian Kurz’s government coalition. The 32-year-old Kurz is the youngest Chancellor ever and chairman of the conservative Austrian People’s Party (ÖVP). Even he sees the need to correct Minister Kickl on a regular basis. Yesterday’s scandal actually has as second part, since Herbert Kickl just did not stop presenting his radical world view. He said there were “some weird legal constructions, some of which are many years old. They are keeping us from doing what is necessary.” By “weird legal constructions” he meant the European Convention on Human Rights. The latter was introduced in the 1950-s, after WWII and the Holocaust. But Kickl wouldn’t be Kickl if he did not want to “have a debate about it” and “pick a quarrel with it”. This was connected to a demand he recently expressed in another interview in which the minister had made clear he wanted to deport delinquent refugees before their cases are legally binding. Again, Kickl’s critics, among them even conservatives, are furious. Many can not believe the man is still in office, since ‘Scandal’ seems to be his middle name. A year ago Kickl said at a press conference, he wanted to “concentrate” refugees in central service centers. He must have known where the word “concentration” came from in this kind of context, namely from Nazi times. Along with the FPÖ’s general stance on migration, that quote lead to protests. “Concentrate yourself”, protest banners read. A popular swearword which starts with an ‘a’ in both German and English was added to quite a few of those banners as well. 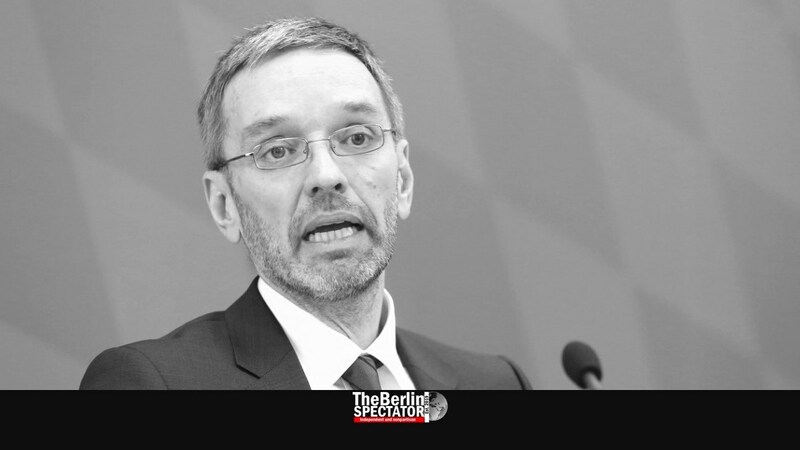 In late September it very much looked like Herbert Kickl wanted to lever out the freedom of the press in Austria, when an internal e-mail to the communication departments of the country’s police leaked. It said the coverage about the police in some media was one-sided and negative. That e-mail, distributed by a spokesperson in Kickl’s Interior Ministry, included a ‘solution’ too: “I suggest we limit the communication with those media to the bare necessities”. Many believe it was Kickl who made sure that mail was sent out. Chancellor Kurz intervened, Kickl tried to back-paddle. The so-called BVT Scandal is another incident Kickl was made responsible for. One of his party colleagues had a search warrant executed at the Austrian Office for the Protection of the Constitution and Counterterrorism (BVT), during which sensitive data were confiscated. Kickl was accused of influencing that search and damaging the BVT’s reputation. This scandal lead to the creating of an investigation committee by the Vienna parliament while the e-mail scandal had repercussions too. Kickl will have to expect truckloads of new criticism after the latest faux pas. Most advertising slogans Kickl himself created for his FPÖ as the party’s secretary general, before he became Chancellor Kurz’s Interior Minister, already showed what kind of approach he would be taking. One of them read “Daham statt Islam” (“Home instead of Islam”, in Austrian slang). Another slogan was the following: “Mehr Mut für unser Wiener Blut – zu viel Fremdes tut niemandem gut” (“More courage for our Viennese blood – foreign things are not good for anyone”). Does that one sound more than weird in English? It does in German too. Apart from that aspect, this slogan was obviously purely xenophobic. Kickl’s Austrian critics, and there are many, will be furious about the next scandal too, but not surprised.